1. Thank and link back to the person who have you the award. 2. Write 7 thing about yourself. 4. Contact the bloggers and tell them about the award! So first of all I would like to thank Brittany over at Mommy-in-waiting for the Stylish Blogger Award. She has journeyed through infertility and now has sweet litle baby John! She has been a great support and encouragement for me! 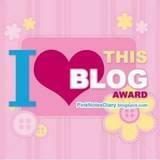 Also to Mrs. Hammer from ...Expect Miracles... for the Stylish Blogger and I Love This Blog awards! Like me, she is still waiting for her miracle baby, and her faith in God, positive attitude and encouragement have been an inspirtation for me! 1. I like to keep busy all the time, I can't sit still for long periods of time or else I get bored. I don't like watching TV or movies without something for my hands to do, so I usually knit! 2. The island of Santorini in Greece is my favorite place I have ever been. I would love to own a B & B there one day. 3. I love puppies. I would adopt 30 of them if it didn't end up like this. Because it would. It is amazing what 4 little Chihuahua puppies can wreck., never mind 30! 4. I love making stuff, like knitting, sewing or baking, but somehow it never turns out like I want it to and I am always dissapointed, even if other people love it. I guess I am a perfectionist! 5. I love airplane food. Not so much the snacks, but when you are on a longer flight and you get meals! I think they taste so good, and I love the packaging and how everything is organized. 6. I would love to adopt from the Ukraine, whether I get pregnant or not! 7. I sometimes go through phases where I eat peanut butter straight. Usually for breakfast, but occasionally at other times too. I haven't done that for a while though! I promise, I am done with the tagging thing for a while! :) And you don't have to do it if you don't want to!